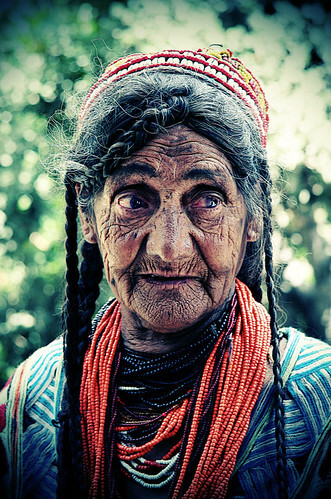 Obscured by high mountains and across the treacherous muddy tracks, there live a people up in the north of Pakistan, who do not even know who they are or from where they came to live a life of isolation – yet maintain and protect their beliefs, their ideology and way of living. 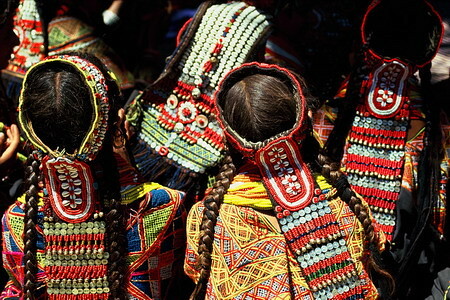 Their ancestry is enveloped in mystery and has always remained a subject of controversy. 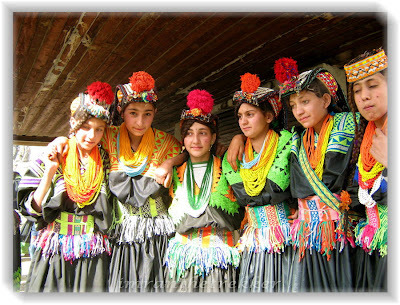 A legend says that five soldiers of the legions of Alexander of Macedonia settled in Chitral and are the progenitors of the Kafir-Kalash. 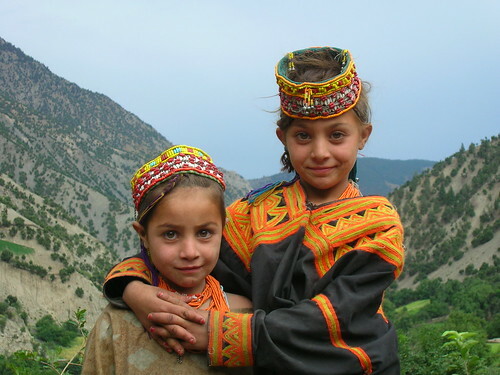 Between the town of Drosh and Chitral city, a track turn to the left from village of Ayun on Kunar river to the Kalash Valley, where these strange yet attractive people live in three villages of Rukmu, Mumret and Biriu (called Rambur, Bumburet and Birir in local Kalashi language). 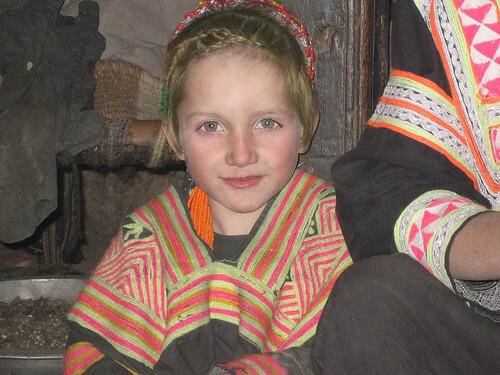 The present population of the Kafir Kalash is approximately 3,000. 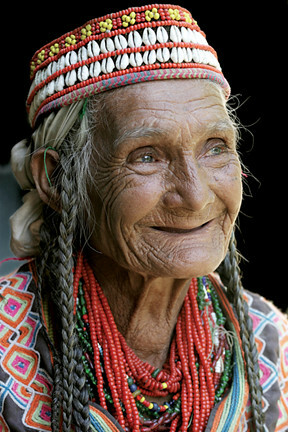 However, after living in obscurity for long, their children are now studying in local schools, but do not move out to seek other avenues of livelihood and continue to cling to their age old traditions and customs. 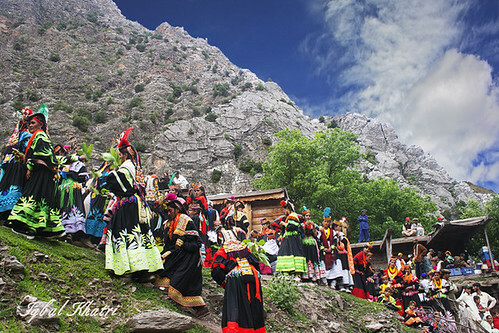 The villages are situated on the southern face of the hillside about 50-100 meters above the river. This protects them from invaders and the floods in summer, and at the same time helps to get sunshine during the winter. The snow that lies on the bottom of the ravine and in the shade do not melt until spring. In summer to avoid the sun, some people live in a second house built on the opposite side of the river. 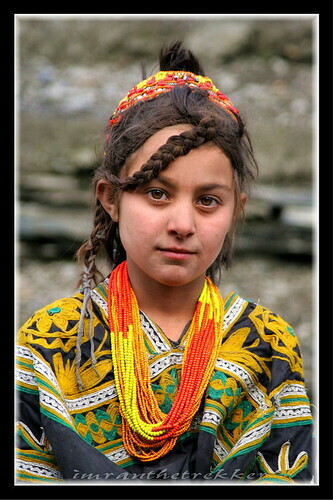 The Kalash Valleys have extensive forests of Holly-Oak and Himalayan cedar. Walnut, Apricot, Apple, Pear and Mulberry trees abound near the villages. 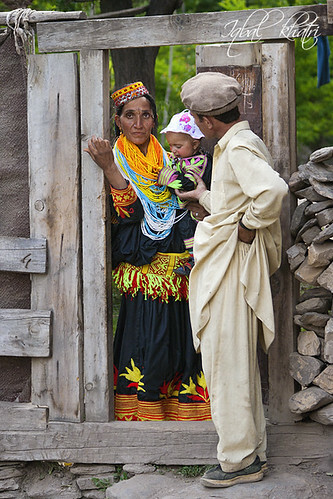 While Kalash men wear ordinary shalwar kameez (the loose long shirt and trousers) as do most of the Pakistanis, the Kalash women wear five large braids of and the ‘Cheo’, a black woolen homespun dress, red-beaded necklaces by the dozen, and an exceptional head piece (shaped differently in each valley) covered in cowry shells, beads and trinkets that flow down their back. 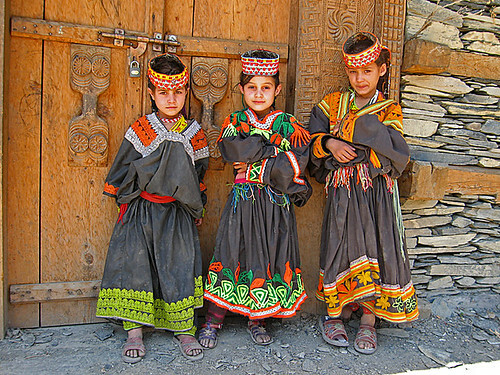 For their black robes, the Kalash are sometimes referred to as the “Wearers of the Black Robes”. Kalash means black in their language. 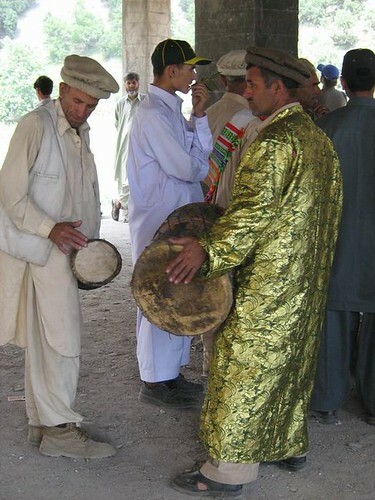 Herein under is a pictorial representation of Kalash people, their fetivals and music. 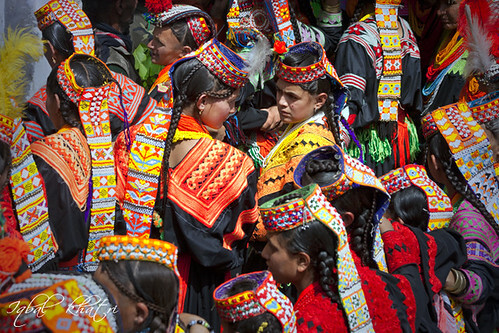 Spring is welcomed to the valleys with girls singing and dancing on the roofs for the Kirik Pushik, the festival of the first flower blooming. 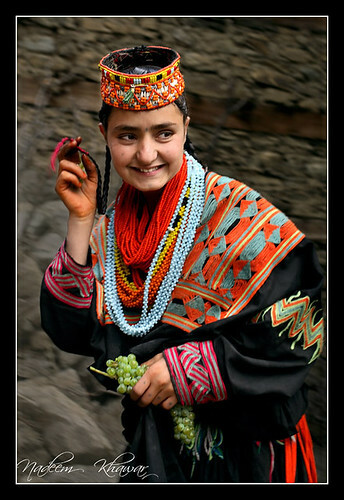 In spring women are allowed to enter the restricted upper valleys, with the Siu Wajik rite, in which a girl crushes three walnuts as an offering on the boundary bridge. Joshi, the main spring festival, is held in May. All the houses and the temple of the goddess Jeshtak are decorated with walnut branches and flowers, and milk is distributed to all the villagers. Traditional Hip Hop by ?§m? 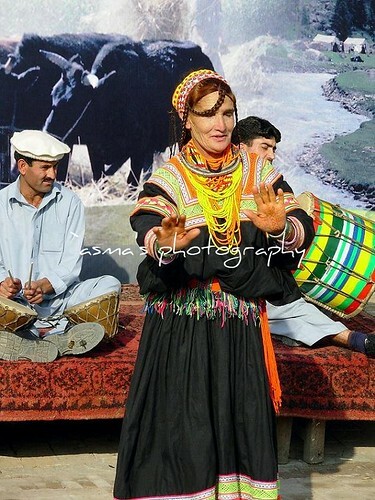 This footage is shot while a Kalash woman was playing flute and it is so sweet, when one looks at the ambience around her and the music.